Mallee Boys is an enthralling novel that captures the unique voices and lives of two young brothers living in rural Australia as they bridge the gap from childhood to adulthood. Parties, schooling, farming, deadly snakes, grief and loss, family, and friends, Mallee Boys encompasses the simplicity of everyday life and the many complications it brings. Sandy has only months left of Year Ten. Months to decide if or where he can continue his schooling. Red is happy his school days are behind him. Now he can help his dad on their farm, play footy and hang with his mates. Both boys are still grieving the sudden loss of their mother who suddenly died only one year ago. As their days fill with work, dirt biking, friendship complications, and trouble with girls, both Sandy and Red face decisions that will shape their futures. Mallee Boys is written from the perspectives of brothers Sandy and Josh (known to all as Red), alternating with each chapter. The writing style is conversational and informal, really digging into the psyche of Sandy and Red, who come across as authentic young men. The story is heavily narrated, almost diary-like, often referring back to past events and providing many retellings of the main plot points. Uniquely Australian, I think this book has every Aussie slang known to man. I promise we Aussies don't actually talk like that (at least, not all the time). Unfortunately, there are also quite a few grammatical and punctuation errors, resulting both from the characters' informal turn of phrase and editing oversights. The story really hones in on the simple tasks and events of everyday life in rural Australia, something to which many young readers can-no doubt-relate, while others will enjoy this glimpse of rural life. Girls, school, family fights, grief, changing friendships, sports, and the relationship between brother - all are issues that are relatable to this book's young adult audience. 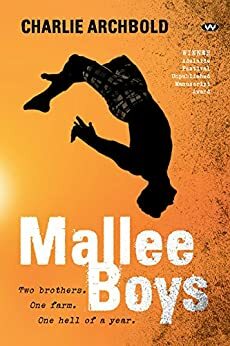 Mallee Boys is a highly enjoyable coming of age story, where the lives of two brothers come to life against the dramatic backdrop of rural Australia.